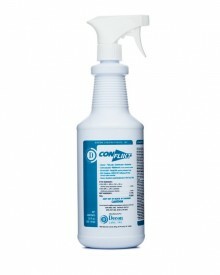 Conflikt ® Ready-to-use Disinfectant Spray is a quaternary (quat) disinfectant that can be used to clean and disinfect hard surfaces in labs, hospitals or anywhere thorough disinfection efficacy is required. Stable solution of dual quaternary ammonium active ingredients is effective against viruses, bacteria and fungi, HIV-1, E-coli and other pathogenic organisms including TB. Available in convenient spray bottles and larger sizes. Conforms to OSHA’s Blood borne Pathogens Standard and is EPA registered.